We welcome a panel of experts to illuminate the events of the day and its meaning and memory: Prof. Tom Buchanan, Prof. Nigel Copsey, Dr Julie Gottlieb, Prof. Anne Kershen, Dr Daniel Lee, Prof. Mary Vincent, filmmaker Yoav Segal & researcher Liam Liburd. There will be an exhibition in Jessop West on ‘The Battle of Cable Street in the University in Sheffield’s Special Collections and Archives’, displaying material hat illustrates the deep significance of the day’s events from multiple perspectives – the working -class, he Jewish community, ethnic minorities, solidarity with the Spainish, the forces of anti-fascism, policing nd public order (as well as the BUF’s narrative)- then and since. 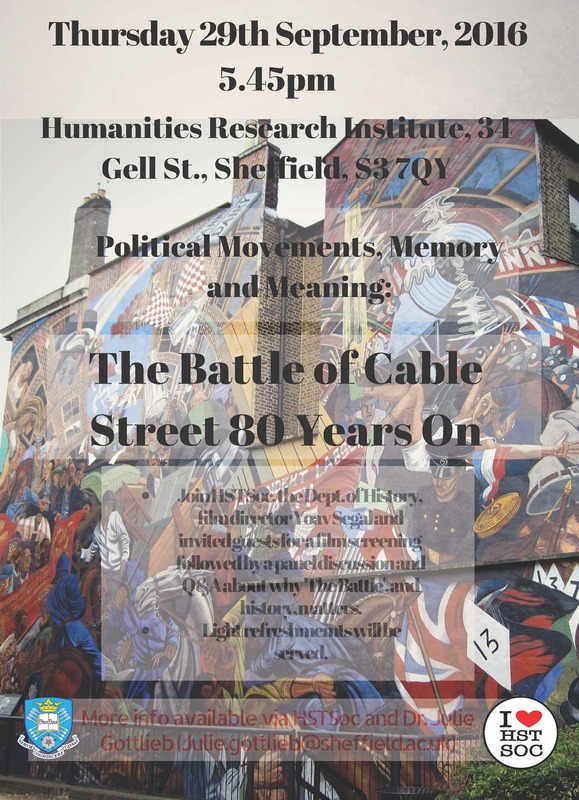 Look out for a special series of blogs on History Matters, guest edited by Dr Julie Gottlieb, that offers further context and aims to generate a wider public debate about the lessons and significance of the Battle of Cable Street today.